If you were walking just outside of the Arts District on Friday afternoon, you may have heard something unusual coming out of the usually buttoned-up strip that includes the Fairmont Hotel and the Fashion Industry Gallery: live music. It was a first for the Dallas Art Fair, and it was a brilliant visual clash between the well-dressed attendees of the fair itself with the equally fashionable set that is Dallas youth and music culture. The scene outside the Dallas Art Fair at Henry C. Beck Jr. Park on a Friday afternoon was a study in contrasts. At one point the power drops out, and a rapper named Bobby Sessions is sprawled on his back, shouting “Hands up, don’t shoot” into the air without a microphone. A crowd is gathered around the musician as he writhes on the ground, delivering the phrase that became iconic following the 2014 riots in Ferguson, Mo. Dallas police officers stand watch on nearby Ross Avenue, as stoic as any British palace guards. They are seemingly unfazed by the pointed sentiment. 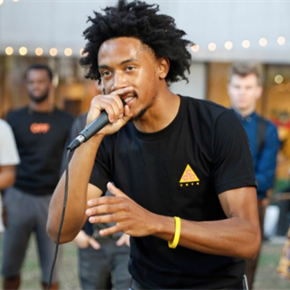 This organized commotion was billed as the Dallas Music Experience — a joint venture between the Dallas Art Fair and a new publication and app called Artist Uprising. The youth-focused magazine is brand heavy. A giant banner endorsing the partnership hangs behind the performers. Photographers wearing the logo pollinate the lawn at Fashion Institute Gallery. One asks me to hold the publication for a photo opportunity. Explaining that I must decline for ethical reasons, I am told that Artist Uprising can be purchased at a discount with one catch: You must post about AU on your social media. You may have not read a word of this publication yet, but know one thing: They are here to penetrate the market. Appearing on the bill is a group of exclusively local artists and musicians, including some that have been active in the Dallas music scene since approximately the early to mid- 2000s. A handful of solo acts ran the musical spectrum between hip-hop, dance music and the blurred line therein: Cygnus, Sam Lao, Bobby Sessions and Picnictyme. This was in addition to two rock acts: Party Static and Sealion. Hearing A Tribe Called Quest’s “Bonita Applebum” blast across the often quiet lawn of F.I.G. was an early indication that this was going to be a departure from art fairs past. Although the song is nearly 30 years old, it sounded like a streaming exclusive just announced today in this setting. Silver-haired collectors walked past as the music demanded their attention. Picnictyme’s selections proved difficult to Shazam, a compliment welcome by any original D.J. At one point he plays his own track, “Burnin’ Up,” an obscenely falsetto track that should have been a bigger hit. As a member of Erykah Badu’s group, The Cannabinoids, and one-half of the D.J. duo Booty Fade, he is one of the most employable and sought-after producers in the city. Party Static was the first live act, more attuned to performing in a dive bar than on a manicured downtown lawn. “Hello? Do I exist,” asked singer Laura Harrell as she checked her microphone. The group is a truth-in-advertising favorite among Dallas music enthusiasts looking for nothing more than a good time. This slightly obscures the fact that some of the group’s compositions contain complex subtleties upon further examination. But those usually dissipate into the two-lead singer speak-shouting that is Party Static’s approach to vocals. The group started more subdued than usual, the sun stirring a shyness in the slowly developing crowd. By the end of the set, a legitimate headcount had materialized, causing the band to turn its shrieking up to a crescendo. Like so many opening bands, Party Static peaked in its final moments. Bobby Sessions’ follow-up rap act made the expansive outdoor space feel wonderfully claustrophobic. He leads chants as if an arena is returning his request. It takes excessive bravery to call when you know the response may not be as potent as one would hope. Sessions railed against the futility of dollars and cents as patrons shuffled by, sometimes with hands over their ears. He encouraged the crowd to close in on him, and this included the most people of color I’ve witnessed at the Dallas Art Fair in several years of attending. Announcer Randy Guthmiller was in full barker mode, introducing each act at the top of his lungs, sometimes from a second-level platform above the stage area. “It’s about to get popping,” he declared. “We’ve got the Ruinart flowing, so you know it’s a great party,” Guthmiller said. Sealion put on a complementary performance to Party Static’s smirking style of rock. The group’s liberal use of surf guitar sounds suggests a similar celebratory atmosphere, although there is something slightly more downtrodden and suburban about Sealion. Singer and rapper Sam Lao was one of the few acts who had fans actually mouthing words to her songs. She had the advantage of the sun setting, as well as the art fair starting to wind down to its closing hour, with guests trickling out. There was a solidly transient second audience the duration of her performance. “Don’t police my areola,” exclaimed Lao in one of her songs. Besides the forceful lyrical content, Lao had the closest thing resembling a ballad in the entire afternoon. A password was supposed to get the attendees of the music portion of the Dallas Art Fair in for free, especially useful for those fans who would not usually find themselves in an internationally high-profile art event. Although that was a welcome discovery, it was somewhat underreported, leading to some confusion. The crowd seemed mostly unaware that they could go inside, and artist Lauren Woods told me she was not informed of the password until after being turned away. Artist Cygnus, aka Phillip Washington, imagined that his extreme take on dance music would perhaps not go over well once he took the stage. “The audience is a bit more diverse, but there’s that whole entire thing in there,” Washington said as he motioned toward the art fair. “Which stands diametrically opposed to what I’m going to be doing onstage. It’s a bit strange. I feel a bit out of place, but I hope somebody enjoys it.” Unfortunately the concern was in vain. Washington’s set was cut off as he sound-checked. The Dallas Music Experience was a bold marriage between two disparate entities: the Dallas Art establishment, and the underground music scene that has often lacked the same status and backing of the former. Even with hiccups, the seemingly successful trial run could lead to interesting experiments in subsequent years. After his all-day performance, Picnictyme acknowledged the unusual setting. “It’s a weird time to pull some performances off, but ultimately it was cool,” he said.